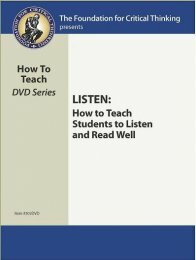 302DVD How to Teach Students to Listen and Read Well (Listen DVD) $14.95	 Qty. Listening and reading are effective means to learning only when done skillfully, yet most students lack basic listening and reading abilities. Therefore, educators at all levels must teach explicitly for them. In this tape, Richard Paul explains and models how to teach for excellence in listening and reading. He grounds the session in a conception of the logic of listening and reading and demonstrates how that logic can be used as a tool for listener and reader self-improvement.